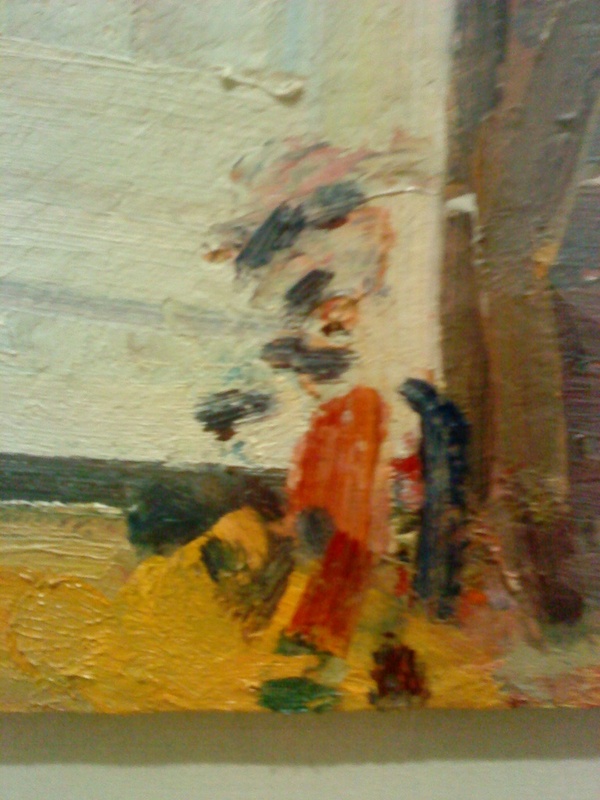 A new show by Frank Auerbach is still an exciting event for me. Granted I am not the huge fan I once was and granted also that his shows are always pretty similar, yet I am still excited as I walk into Marlborough in Albemarle St. It’s lunchtime, it’s raining and I am the only non-staff member there. The show is not large, a handful of portraits, some paintings of what I always imagine is the view from his studio window with sketches and some self-portrait drawings. It is rare for me to feel reverential when walking round a show, but that is how I feel. Here is a man who has pursued the goal of painting with extreme single mindedness, mania even. This alone deserves extraordinary respect. His long hours in the studio, even now when he is over eighty, his fastidiousness in his approach and his overall belief in the potential of the medium put him totally at odds with the contemporary world. He is trying to create objects which have the life of his subjects embedded within them and he believes in the intrinsic power of painting to do that. His dedication is such that any moment when he is not in the studio working is almost seen as a wasted one. A rare recent interview with him here. The work has a lot of presence, the self portraits especially – a rare thing for him. At the back of my mind are a couple of nagging doubts though. Not that I imagine that they would bother Frank. Firstly that old worry about the power of painting to overcome the visual onslaught of the outside world, photography, the internet etc. Secondly I just can’t help but worry that Frank works over a theme again and again – the view from his window being a prime example – in a fashion akin to pressing a key on a piano repeatedly and listening for the difference between each note as it is struck. The sketches are hung in a grid, and they are all different but not in any way that seems significant to me and then I wonder what he is reaching for when he goes over and over the same subject in the same composition, in the same media for years on end. But some of the results are wonderful, and their uniqueness does hold its own against all comers. Although paintings are not seen by very many people compared to other media, once you have made the effort they are still rewarding. More on painting next time! This entry was posted in Art, London, Painting and tagged Art, Frank, London, Painting.